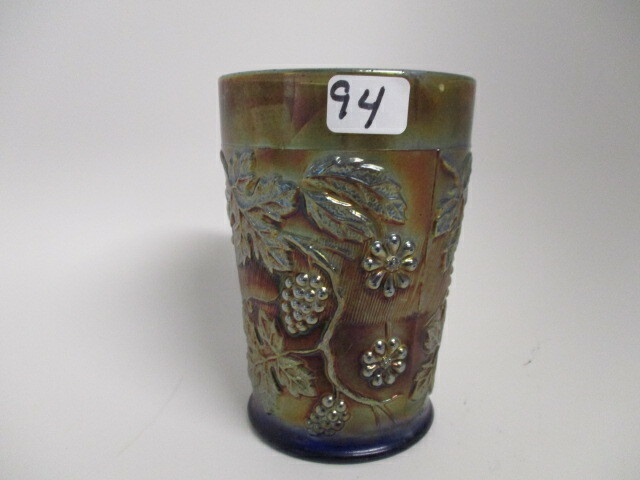 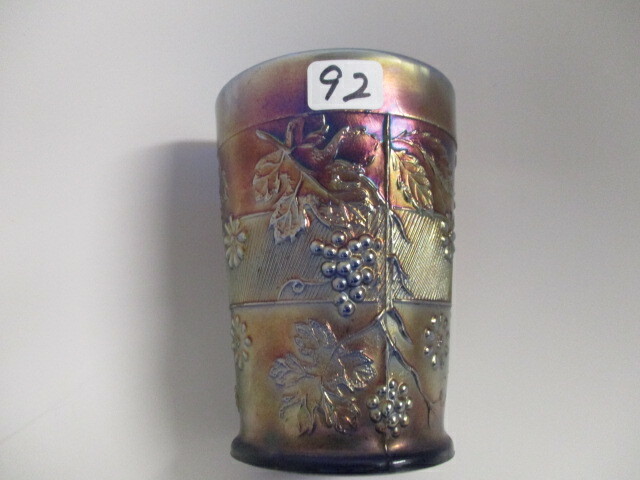 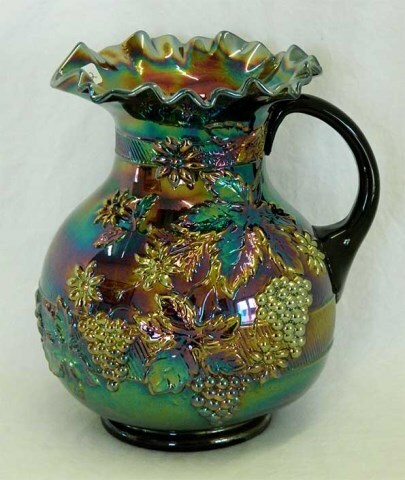 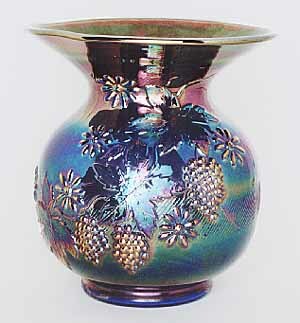 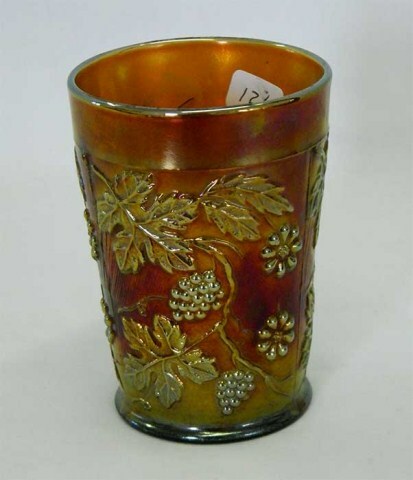 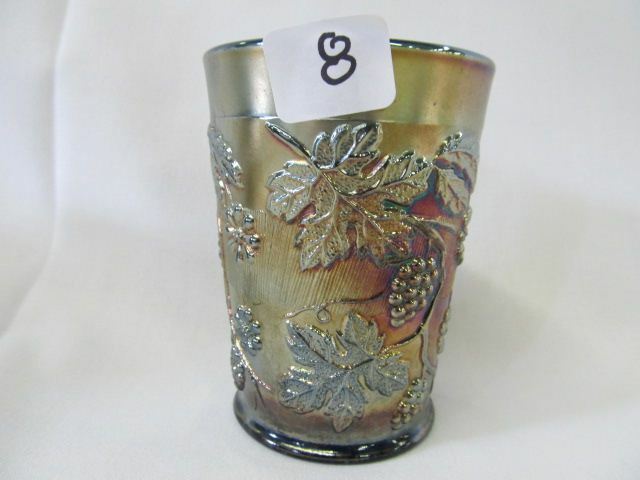 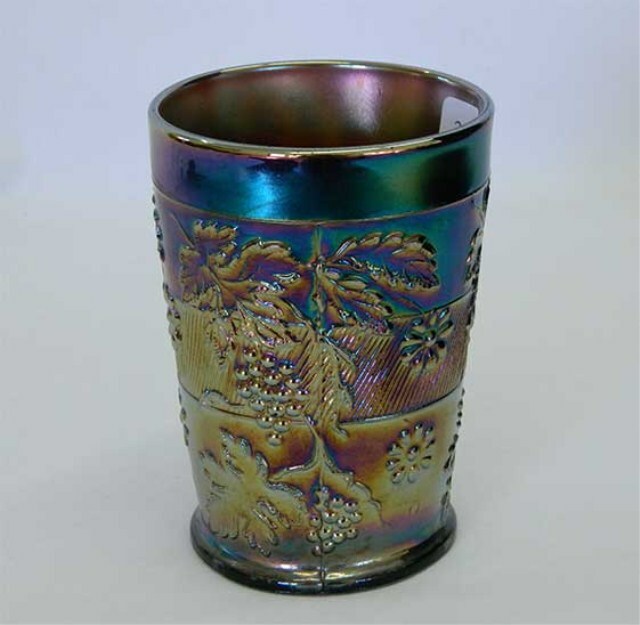 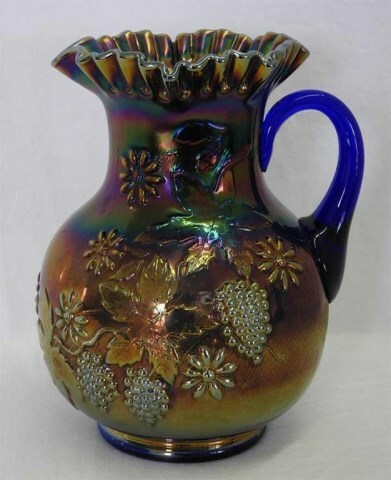 Both Dugan and Fenton made very similar patterns that collectors have come to call Floral and Grape. 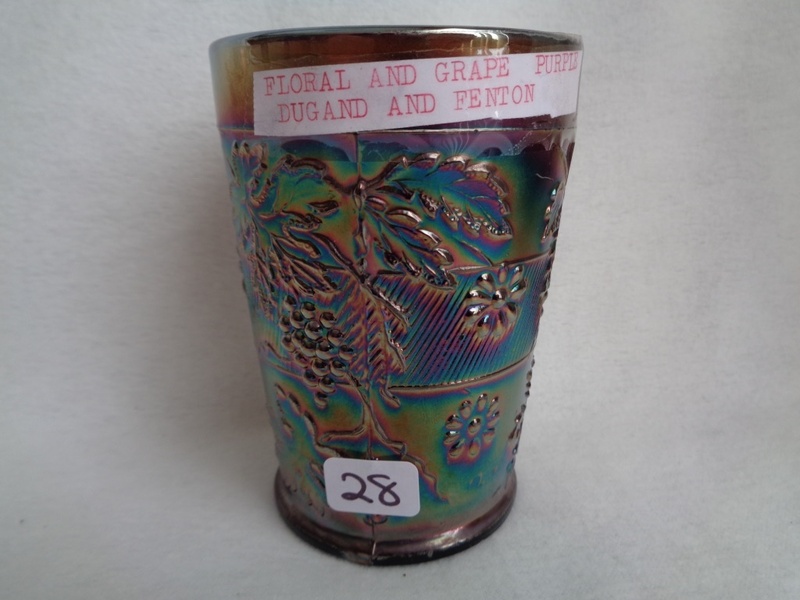 Carnival researchers point to the diagonal lines around the body to tell the difference; Fenton leaning to the right and Dugan to the left. 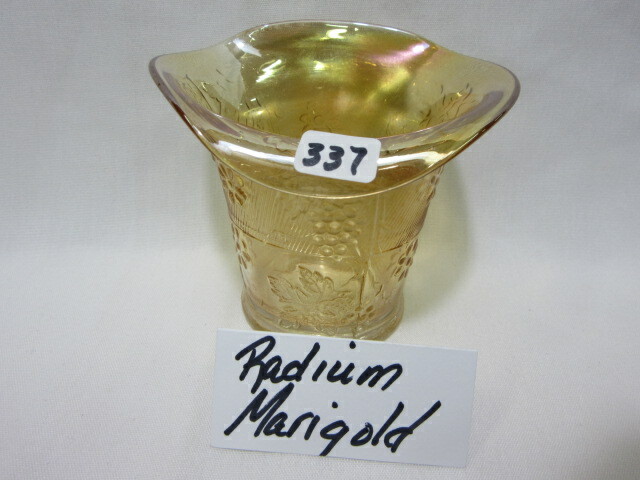 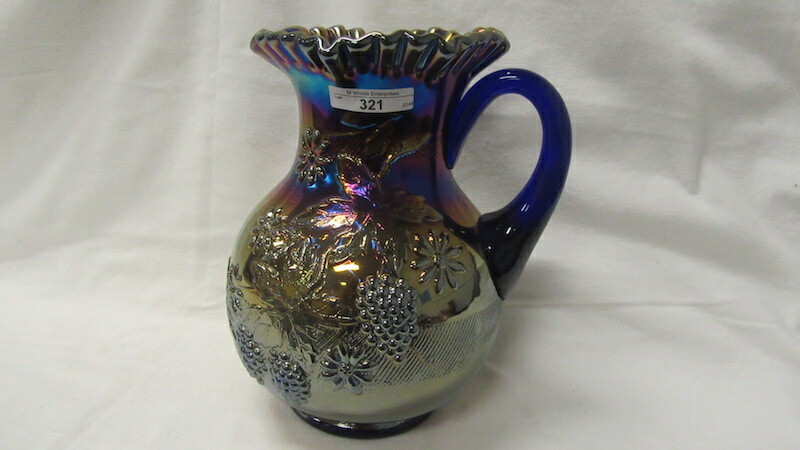 However, it makes little difference in the price as either version will sell for the same–given equal quality. 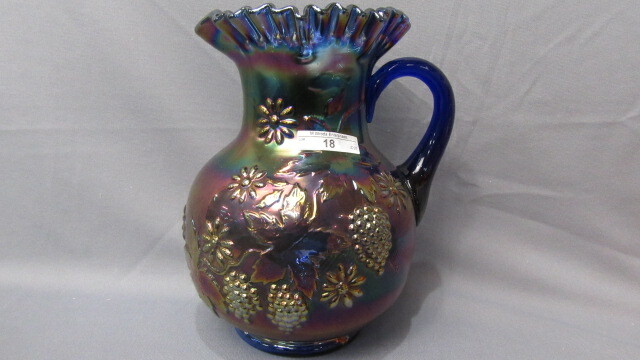 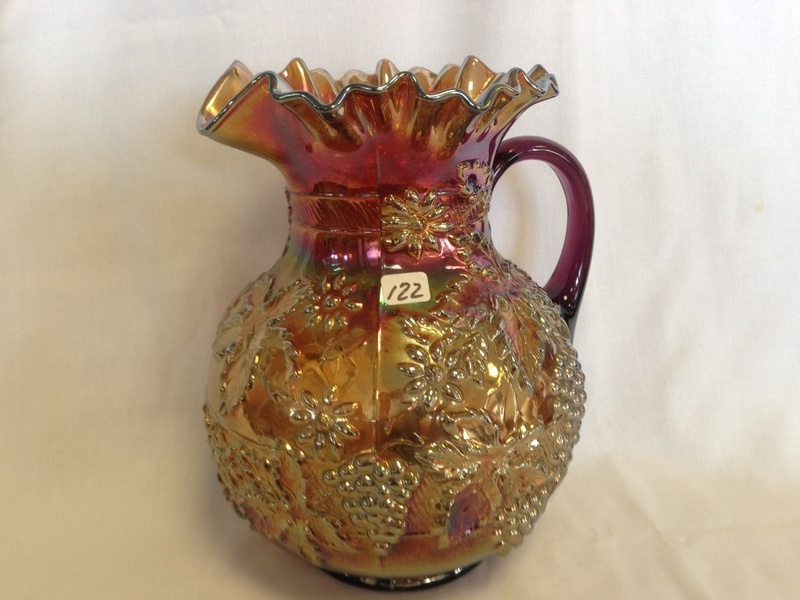 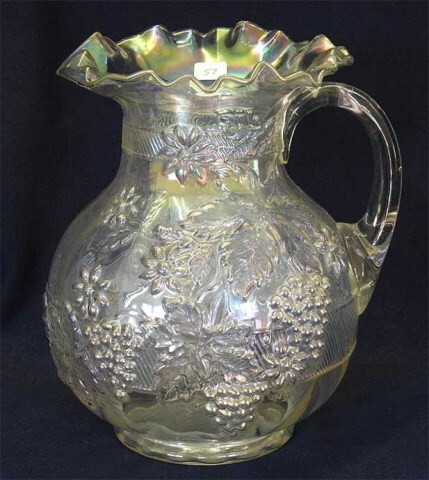 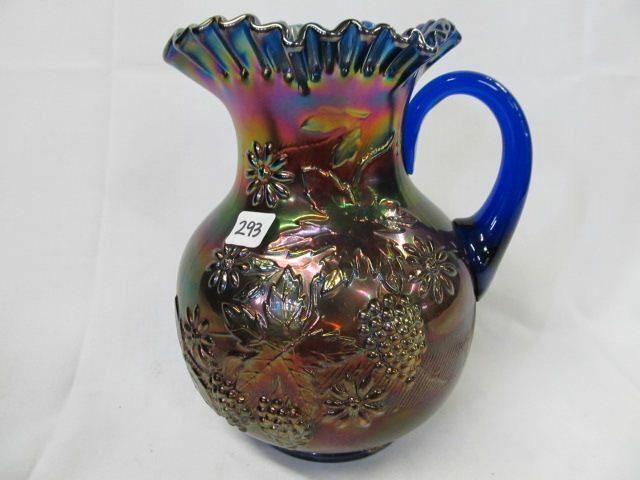 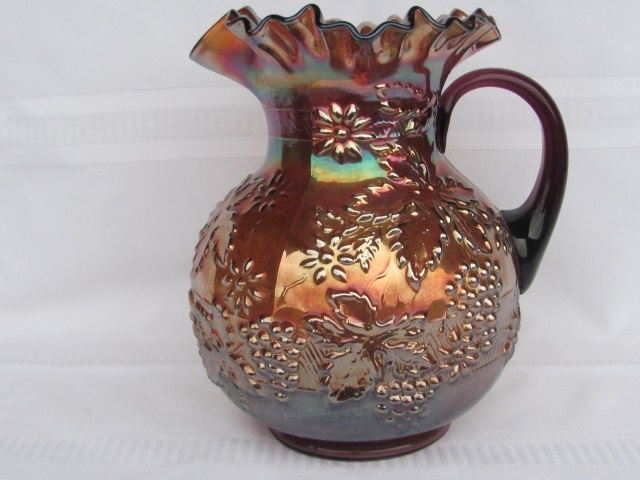 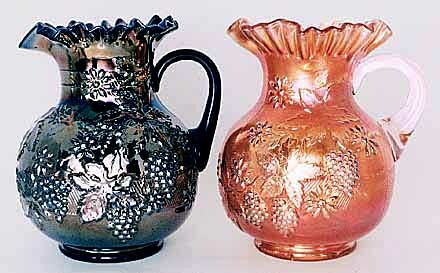 On the right, this Fenton Floral and Grape pitcher does not have the band of diagonal lines running around the body as does Fenton's regular version. 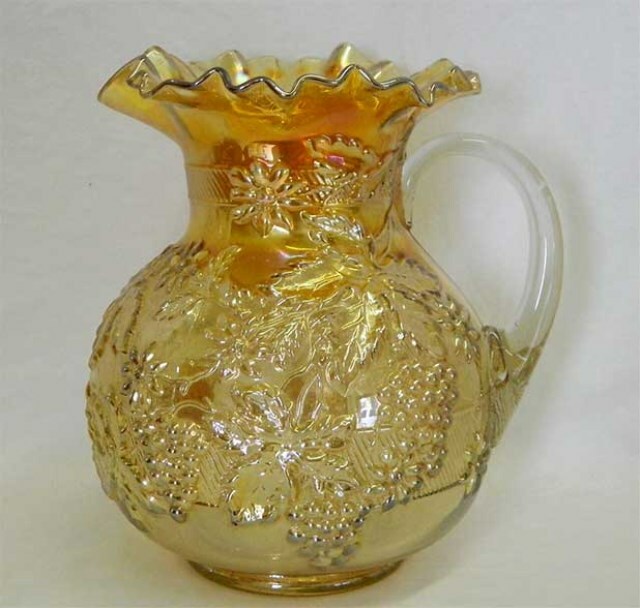 It is referred to as the variant. 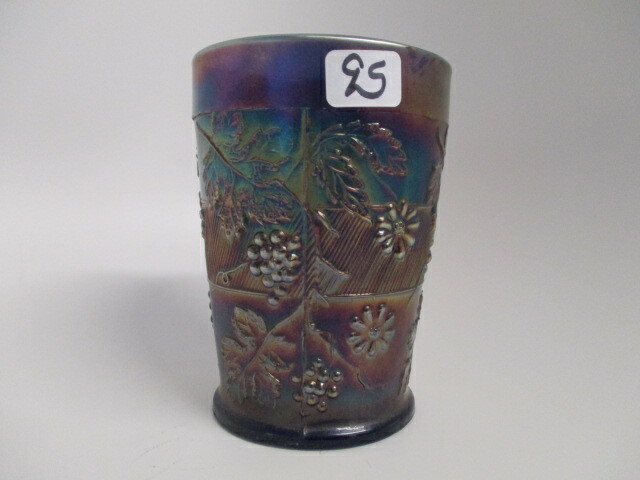 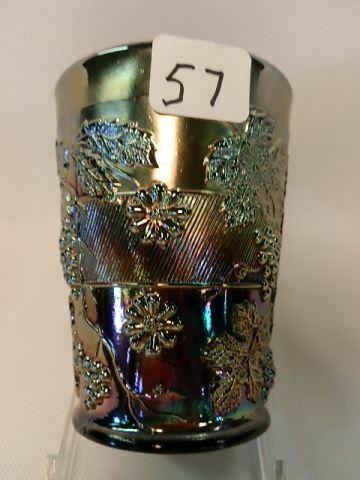 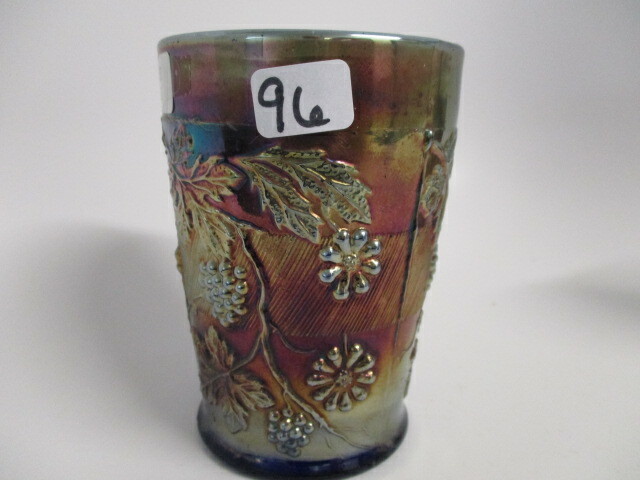 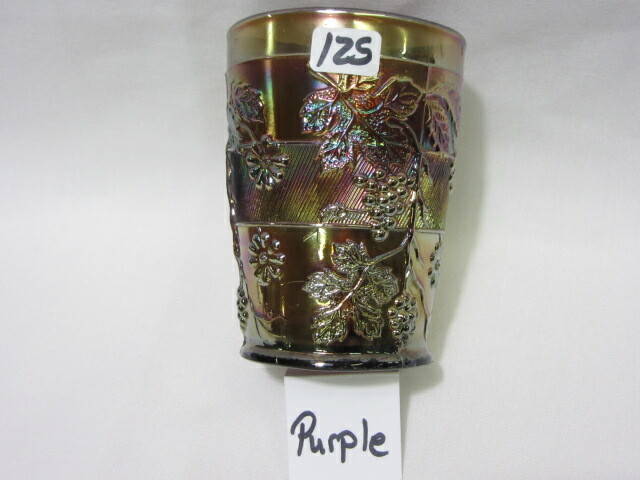 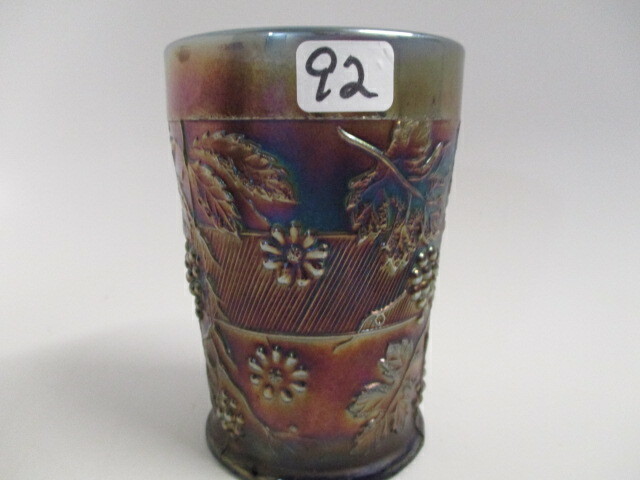 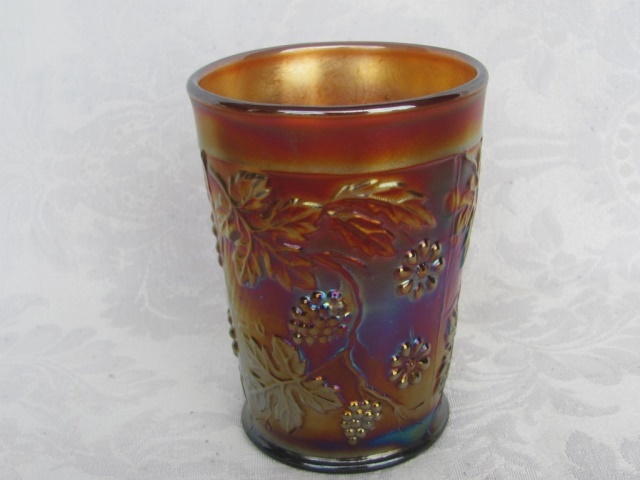 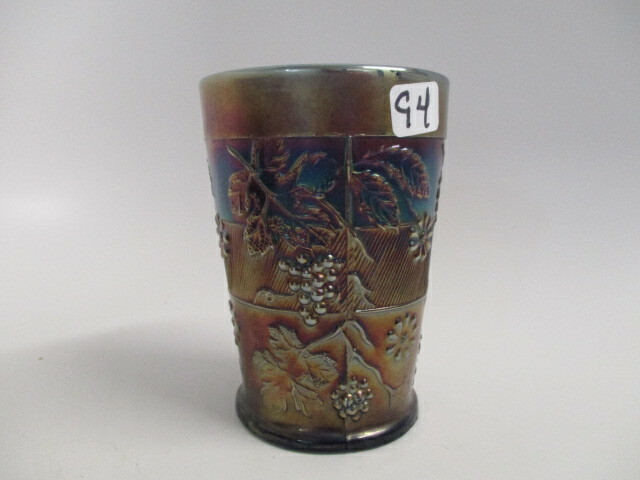 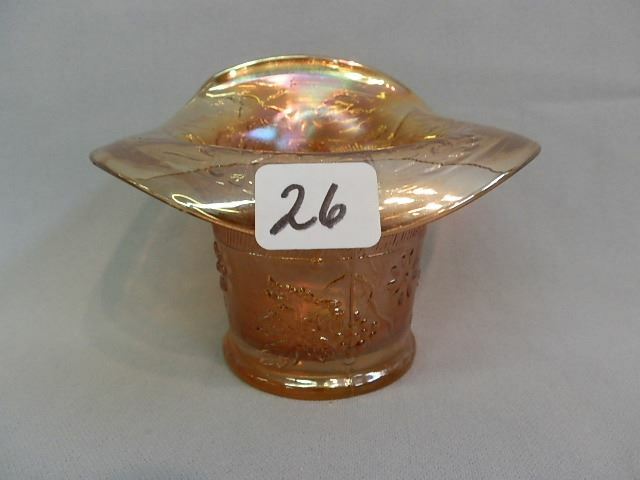 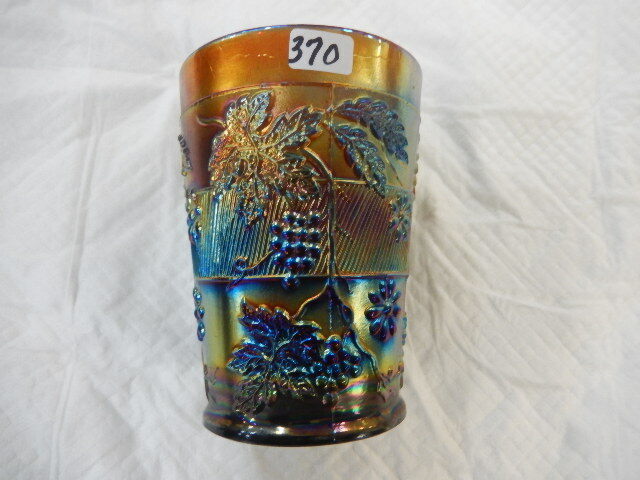 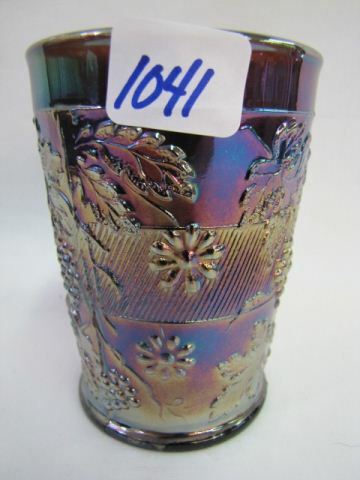 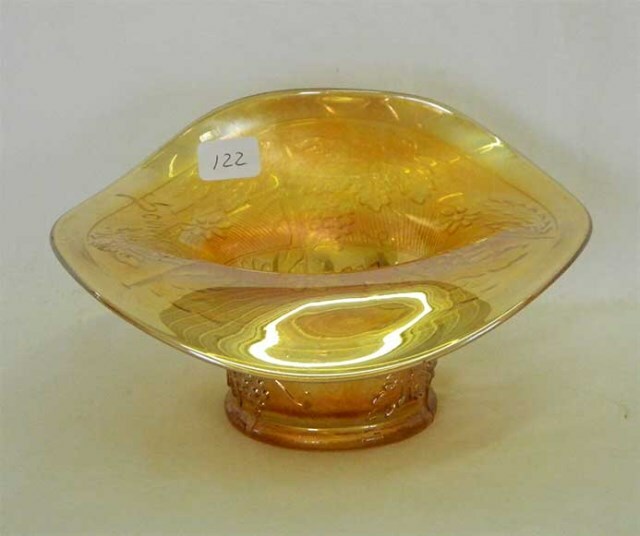 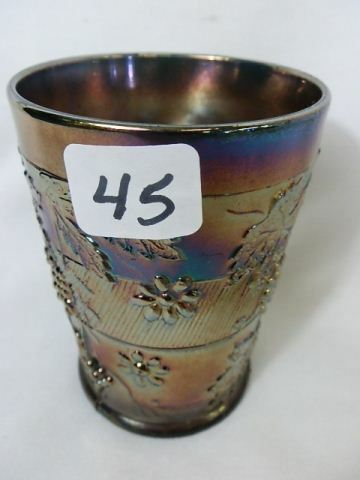 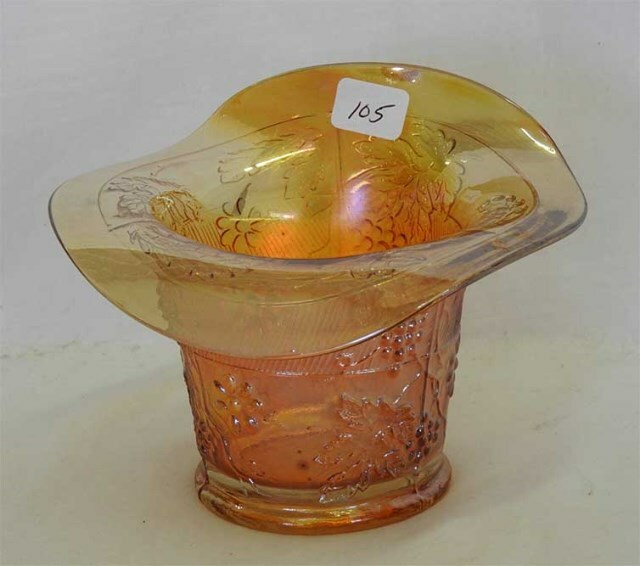 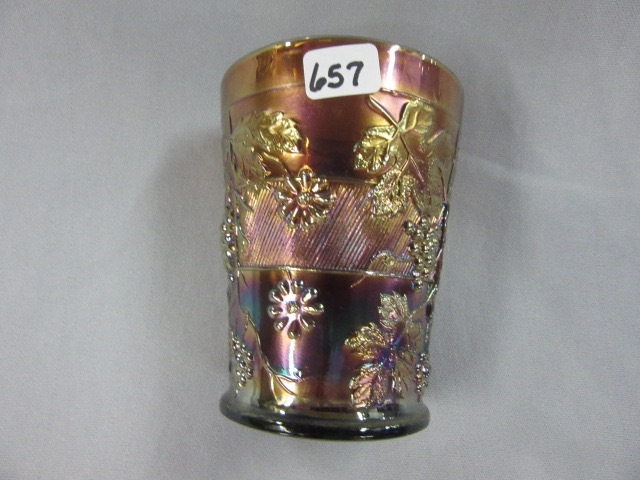 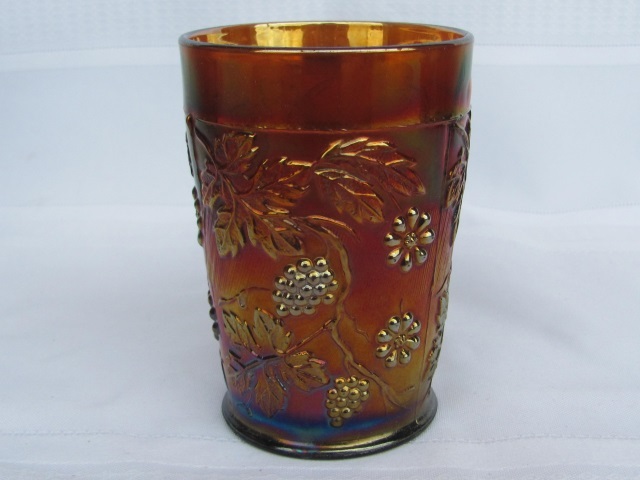 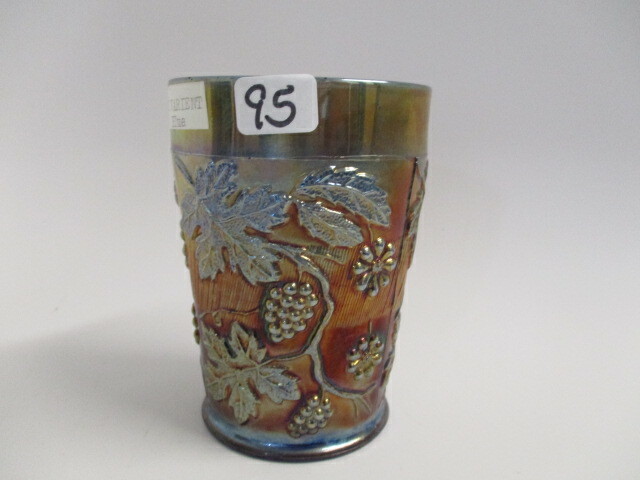 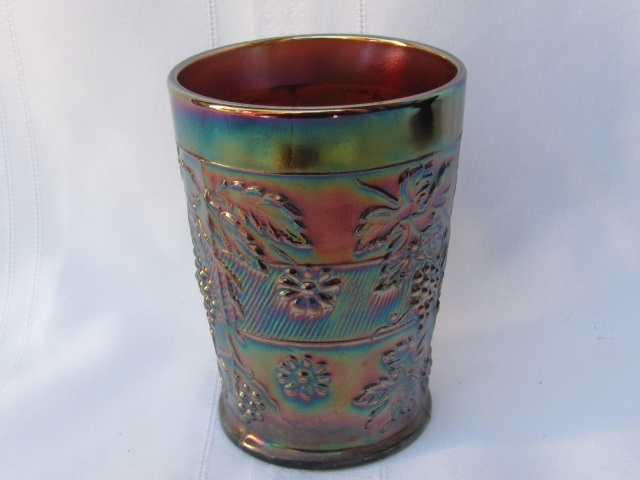 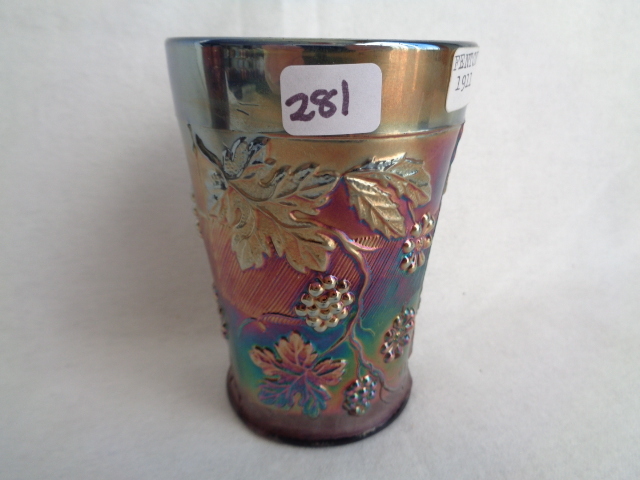 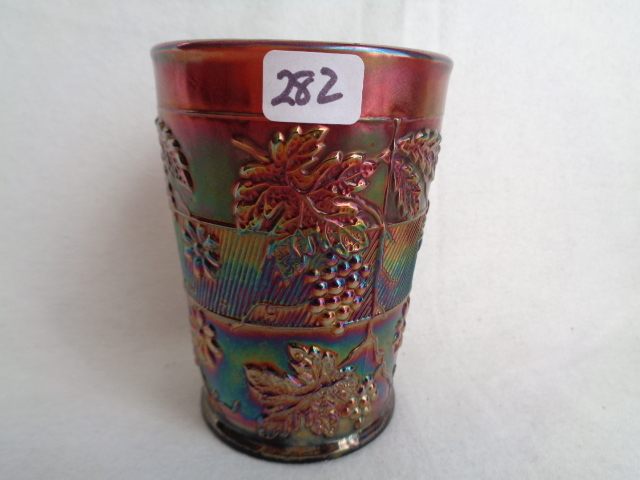 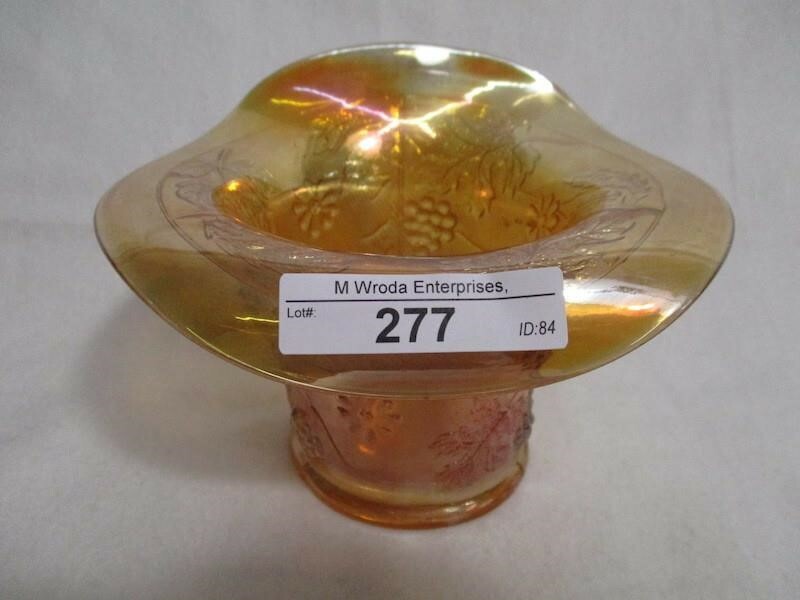 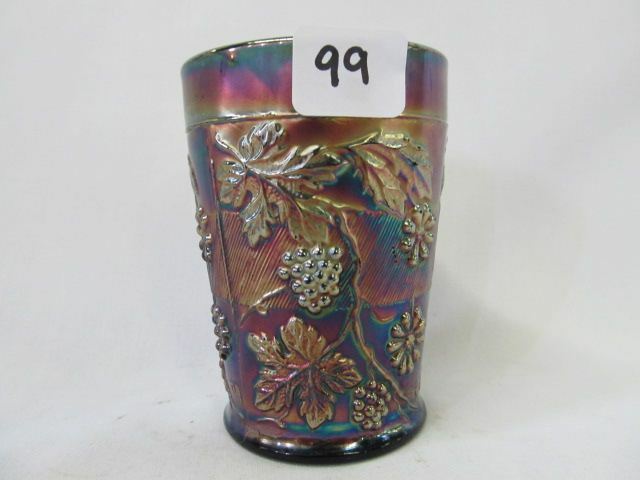 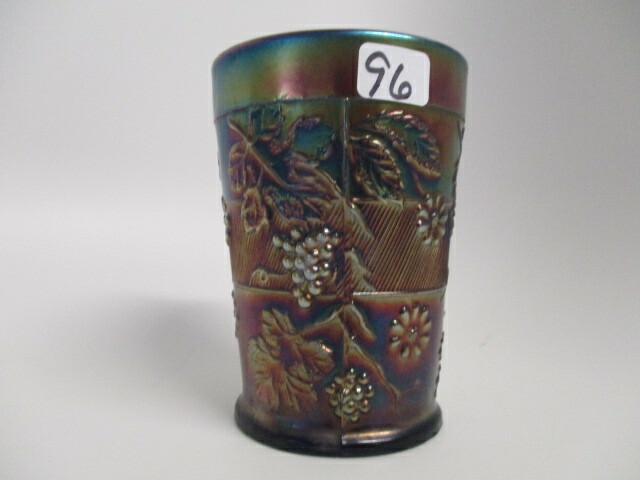 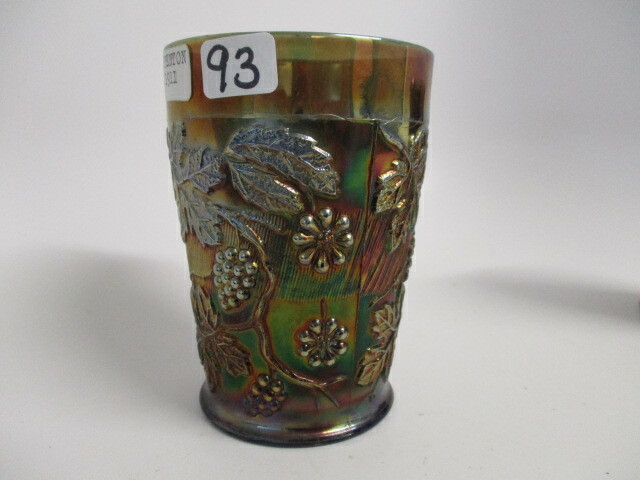 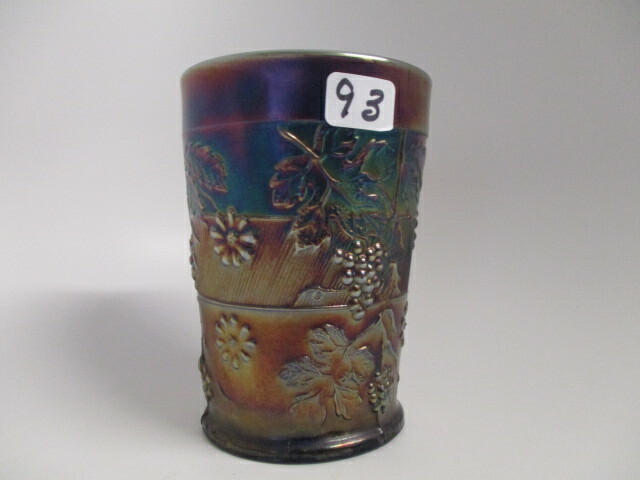 With the tumbler, the bands of lines slant to the right on both versions but on Fenton's the pattern is clear of the mold seams and have no horizontal lines bordering the bands. 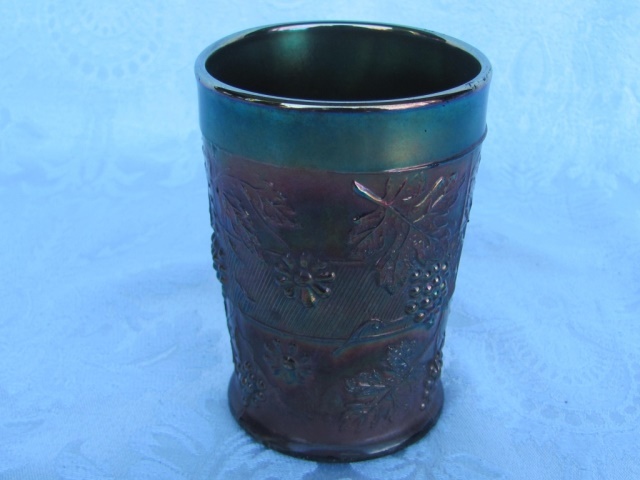 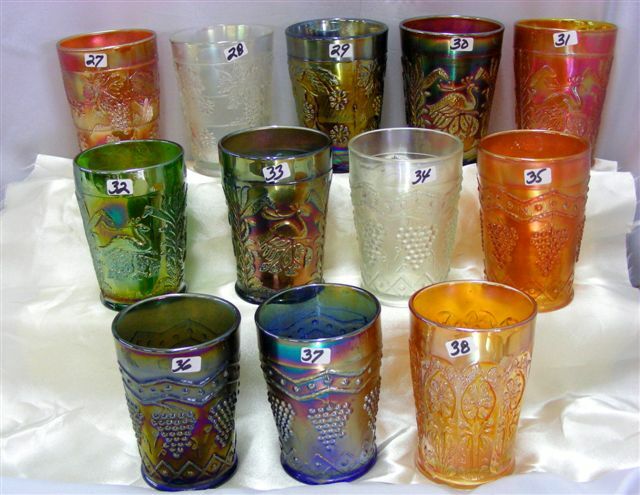 The tumblers were also made into jack-in-the-pulpit whimsies. 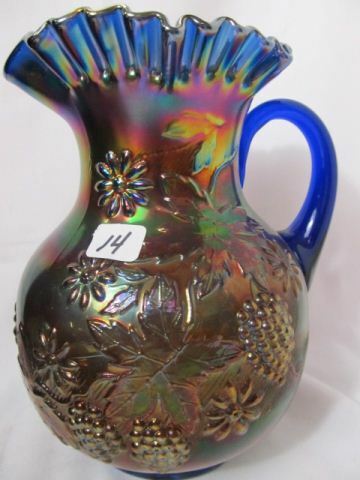 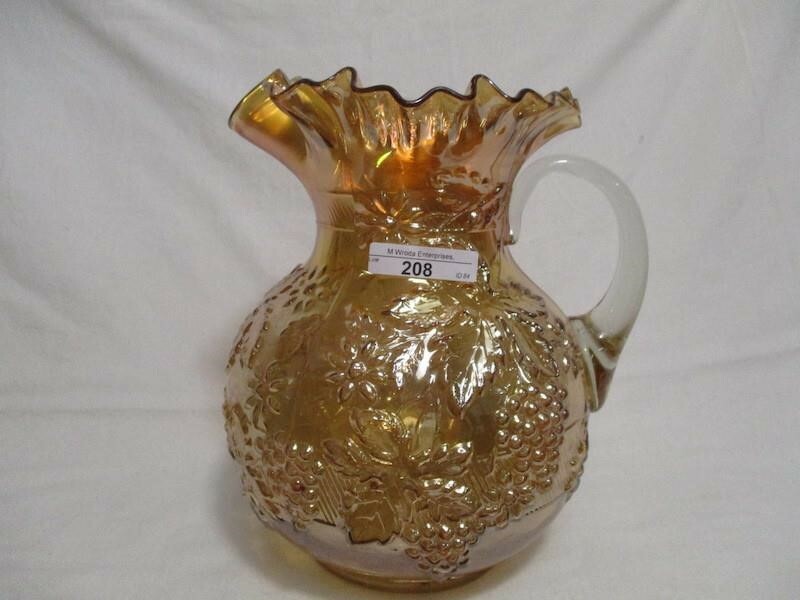 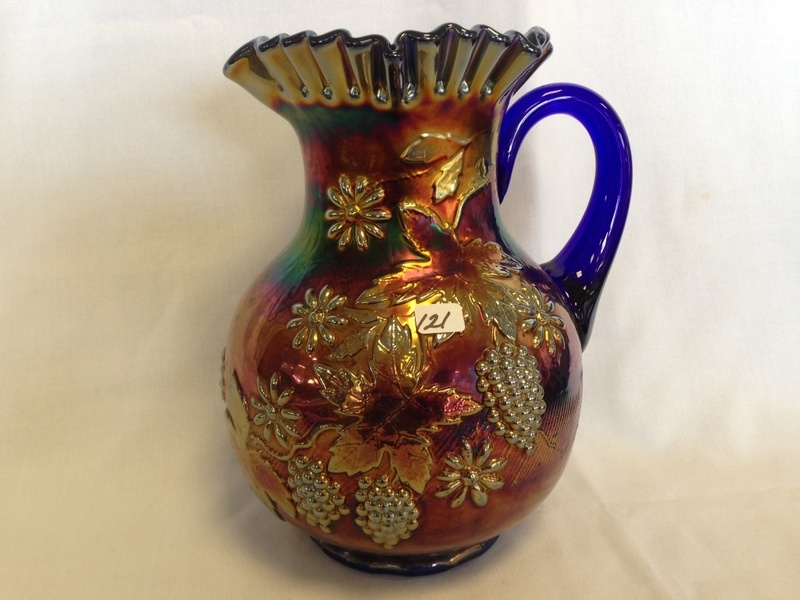 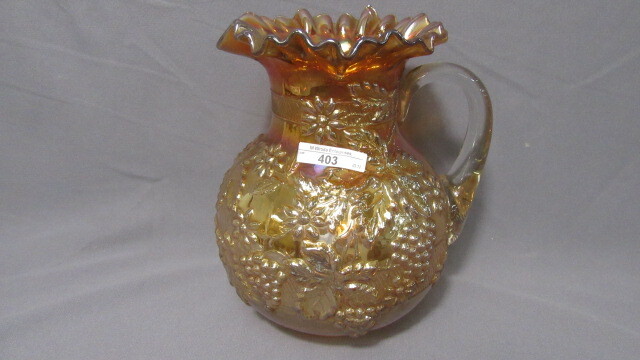 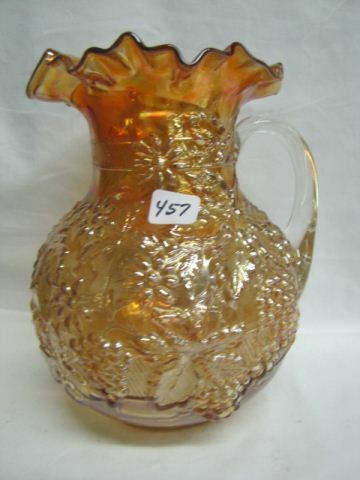 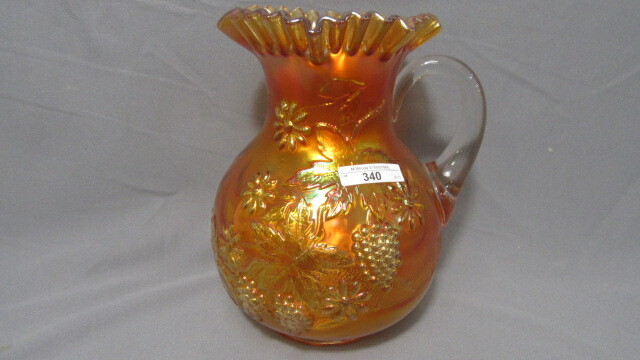 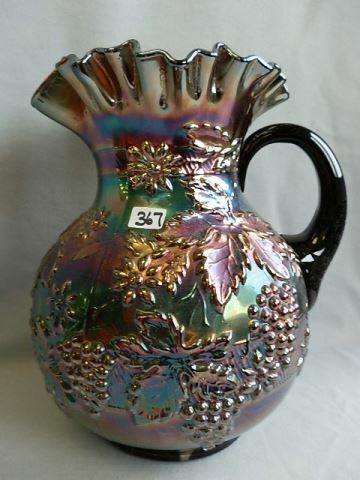 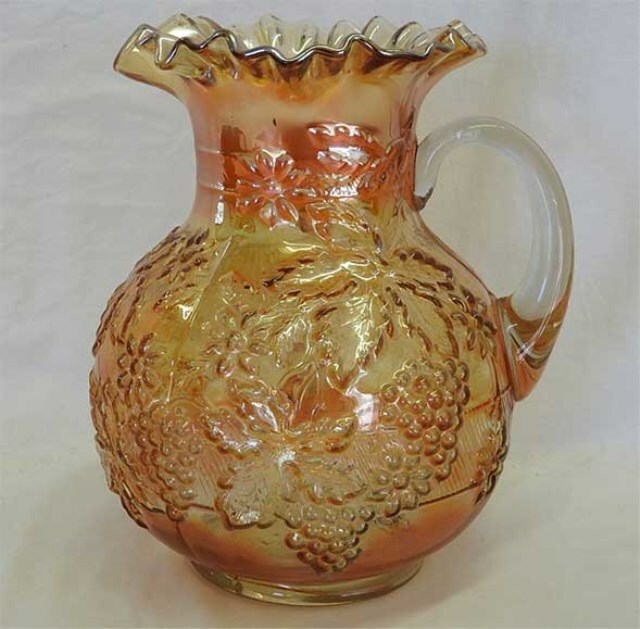 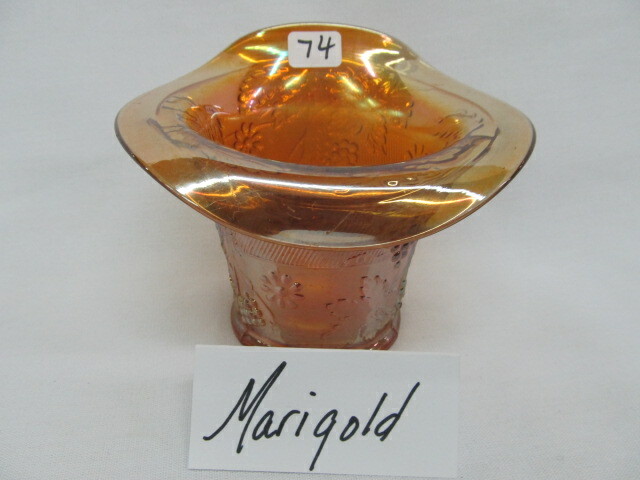 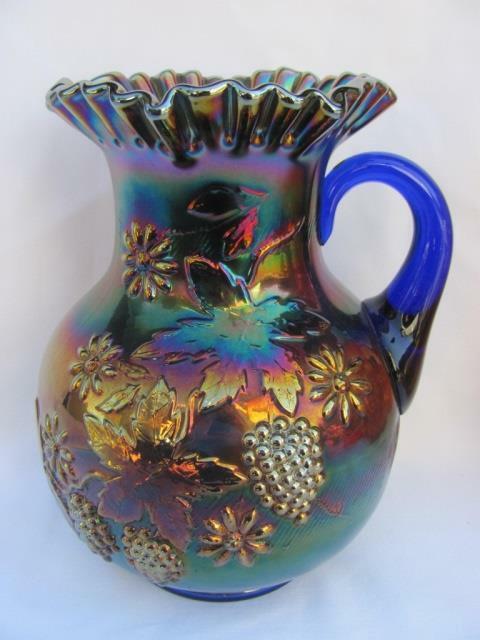 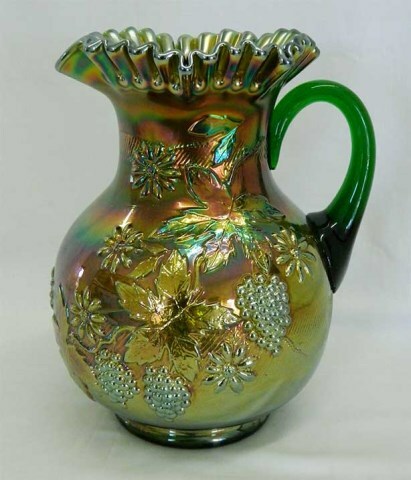 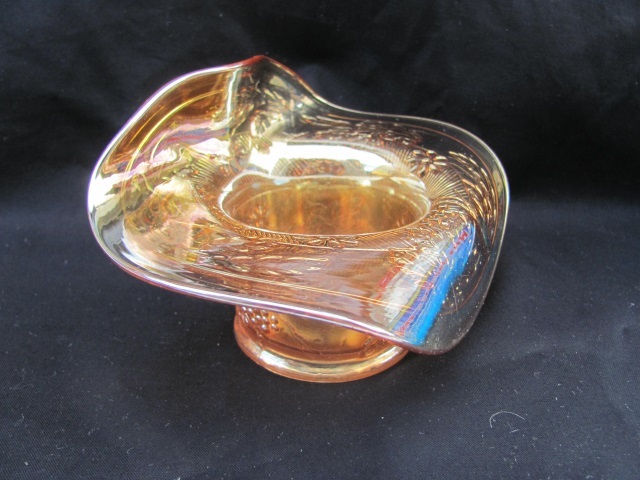 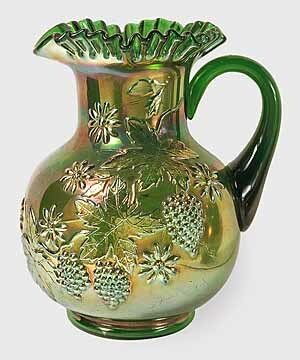 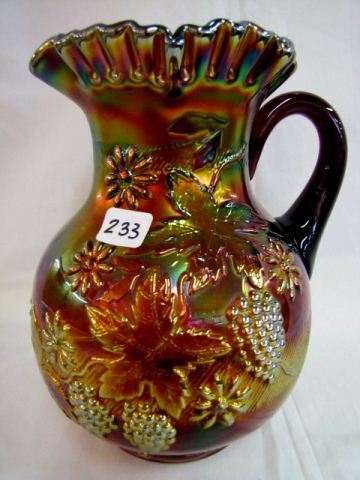 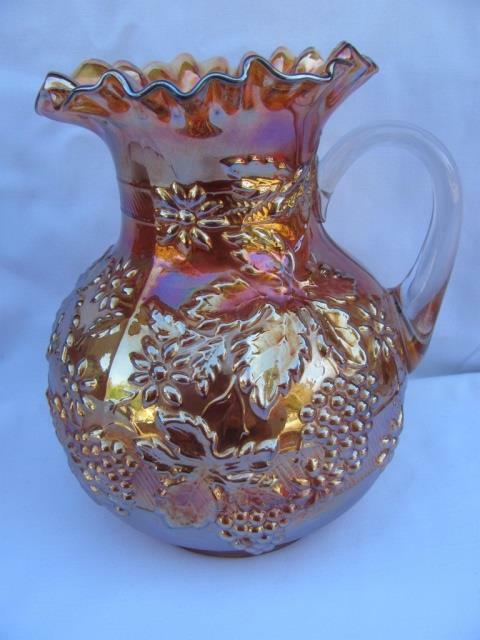 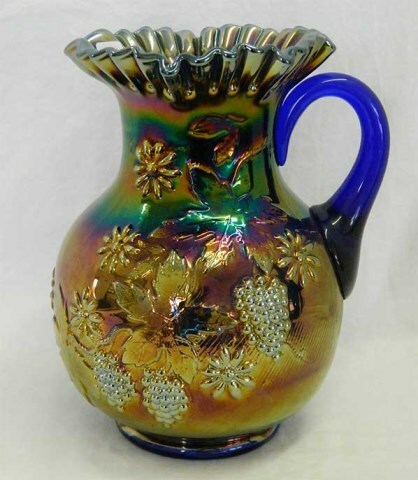 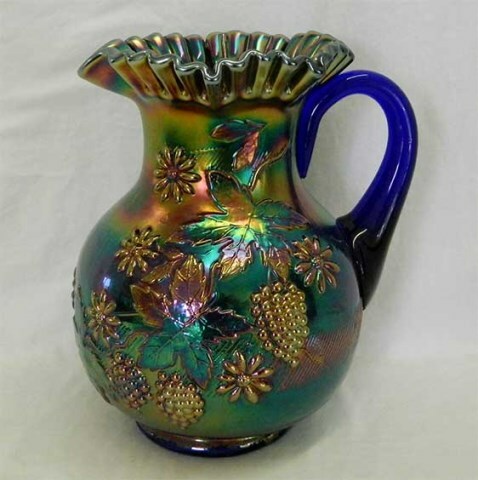 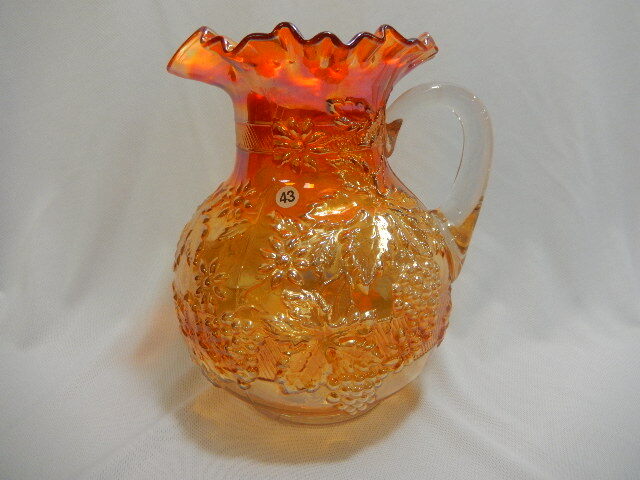 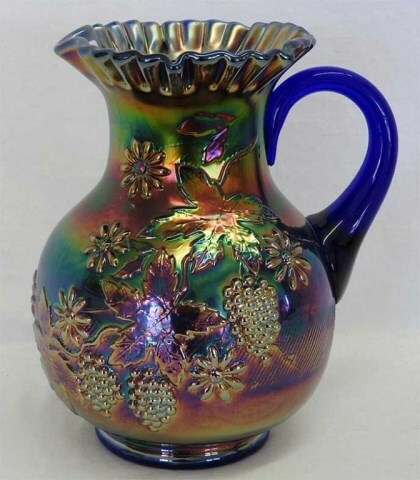 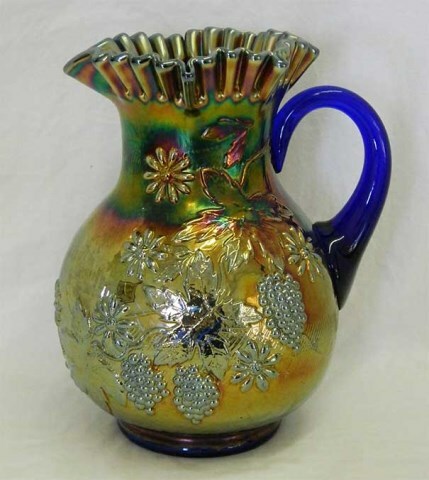 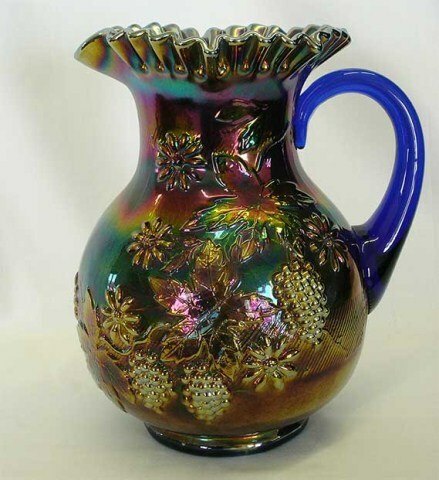 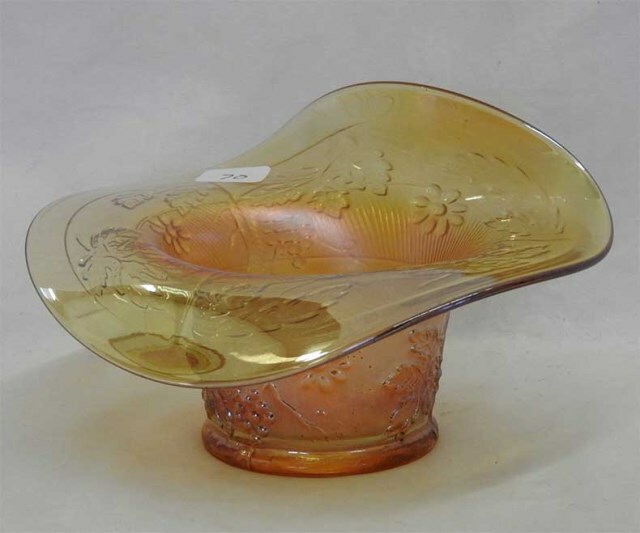 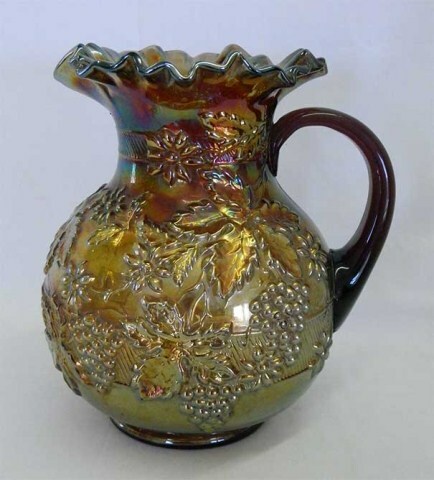 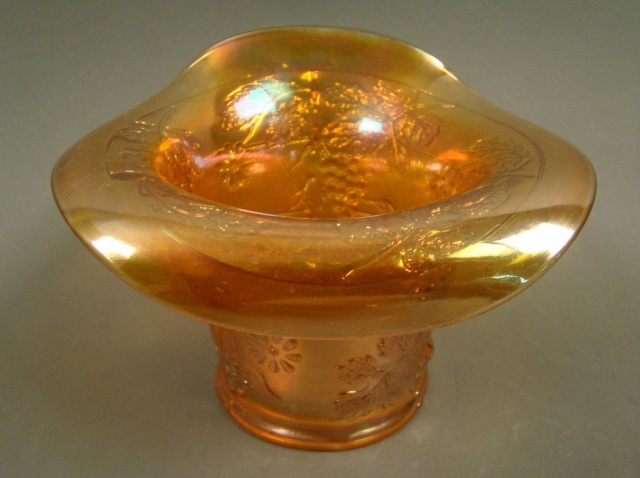 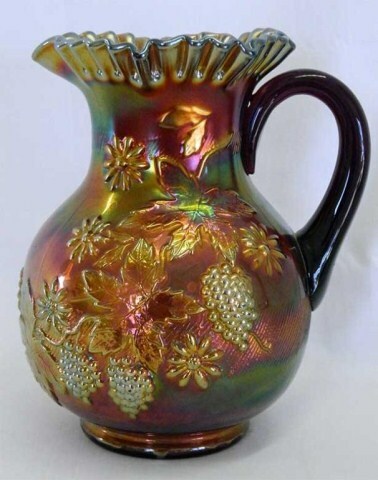 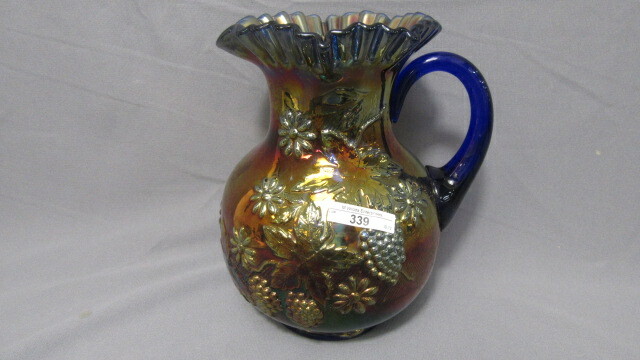 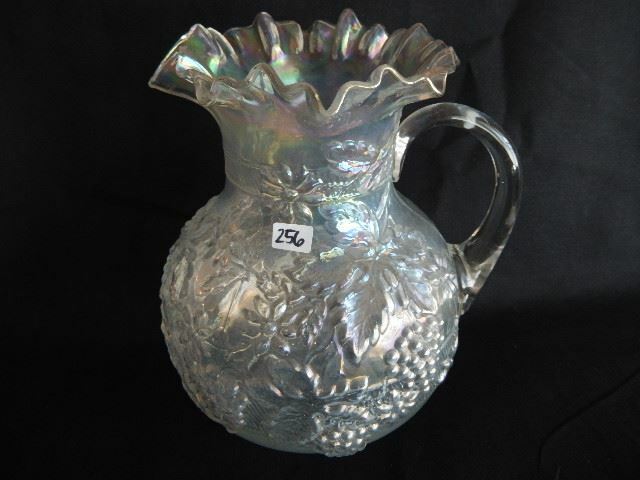 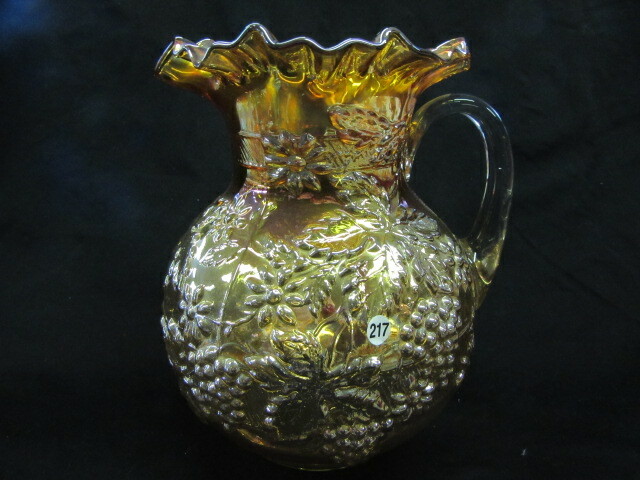 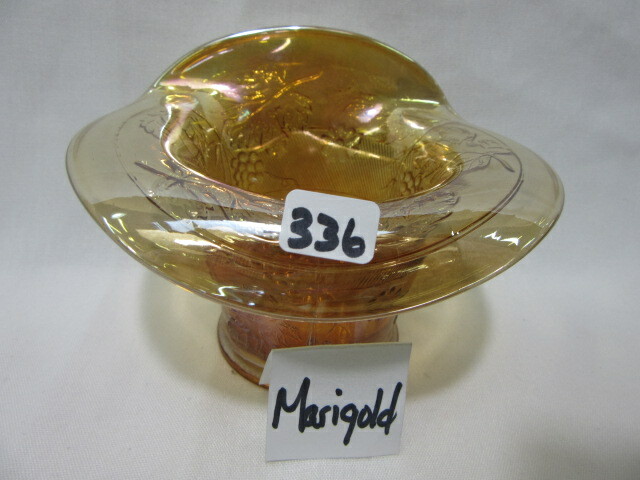 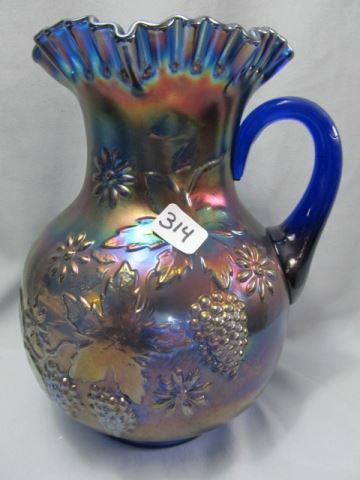 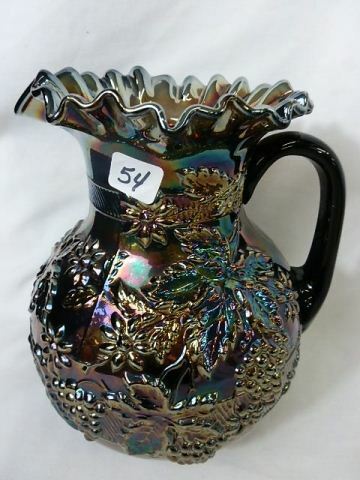 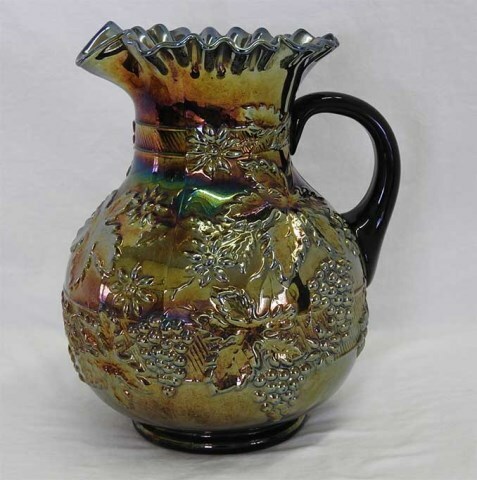 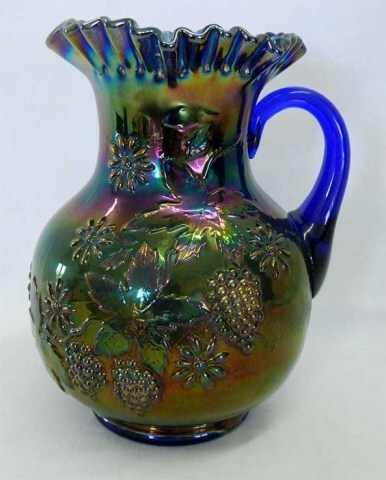 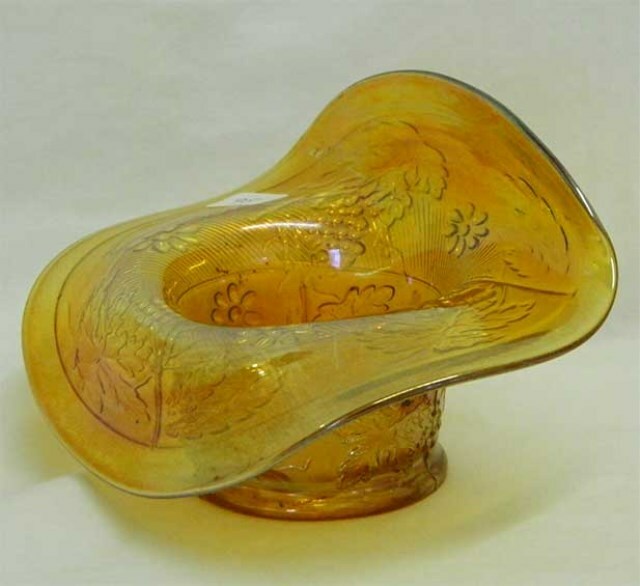 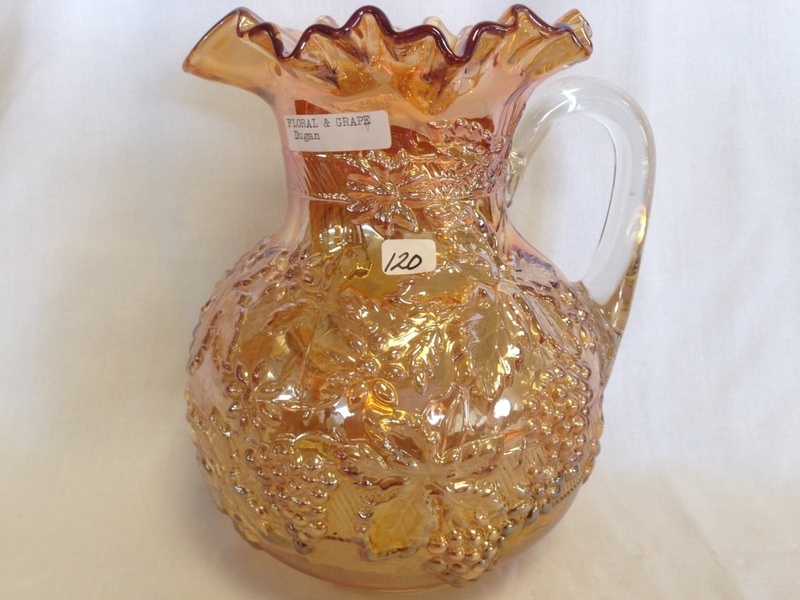 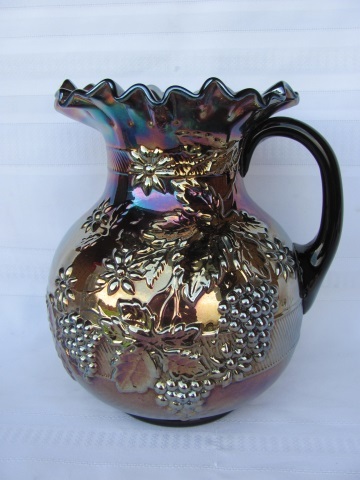 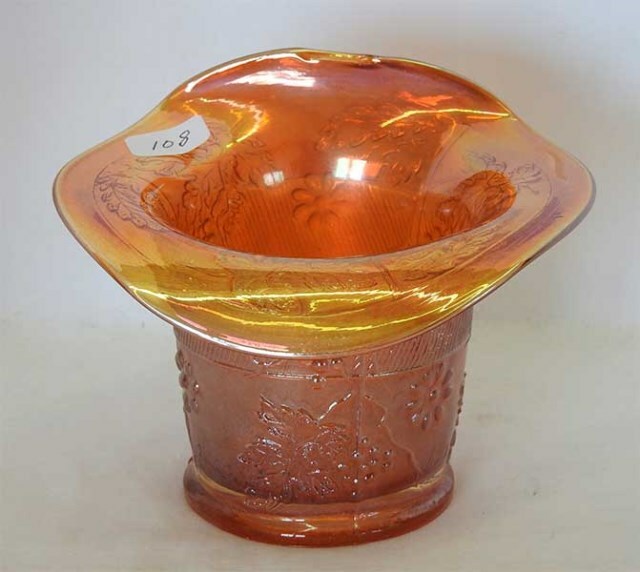 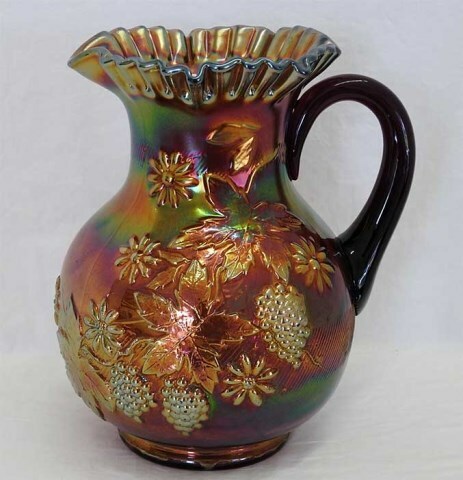 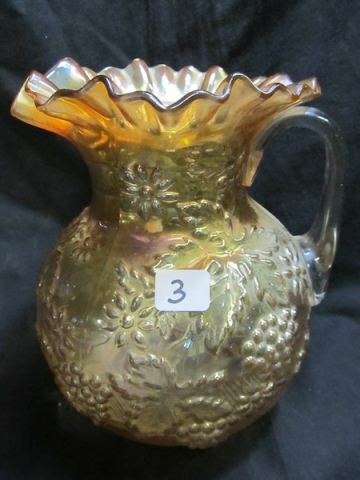 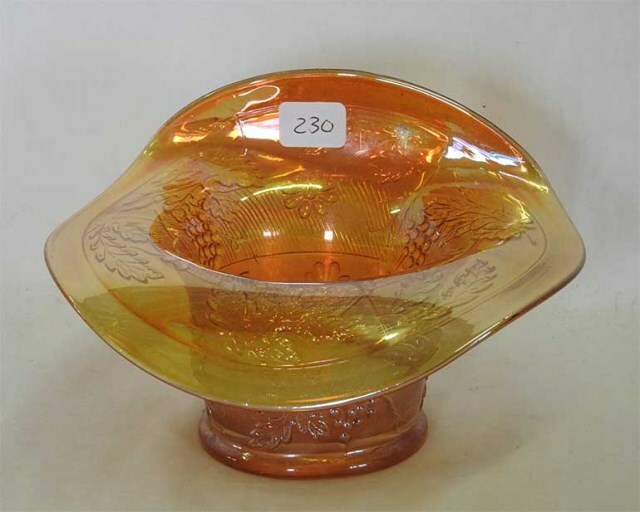 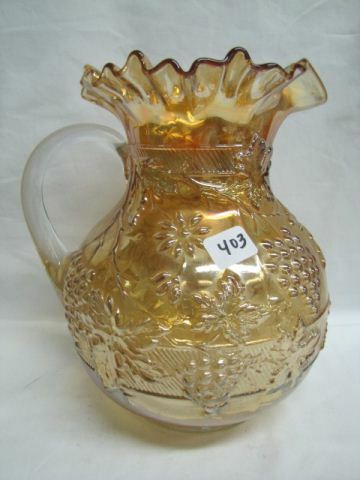 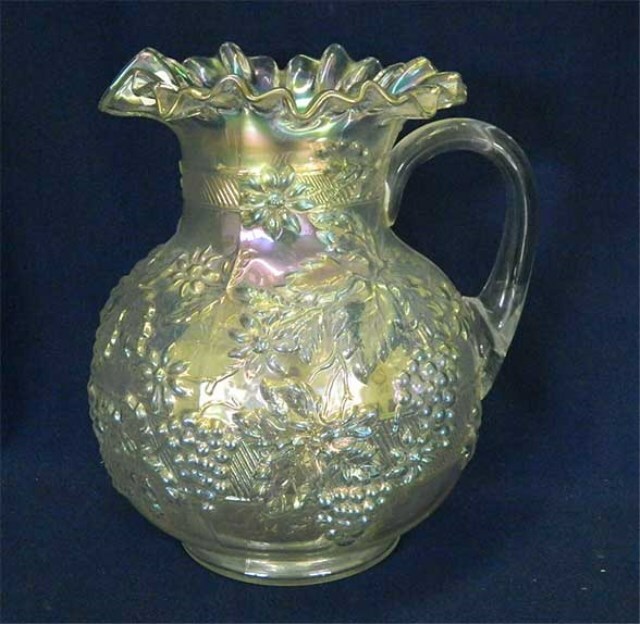 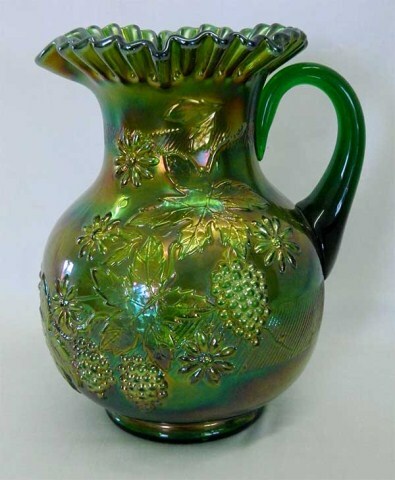 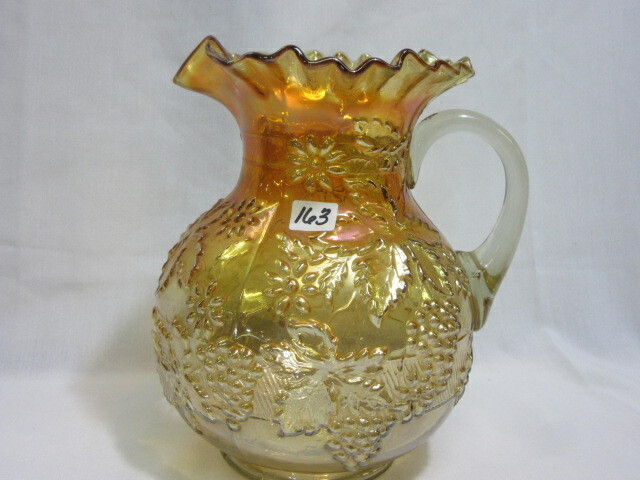 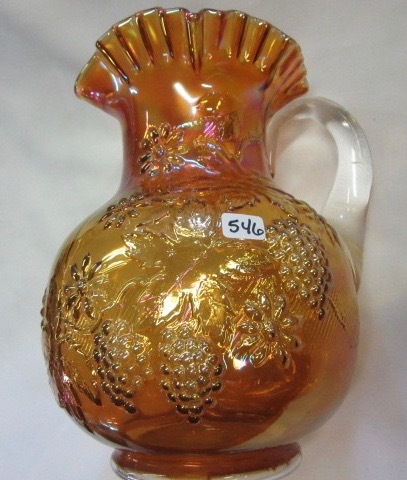 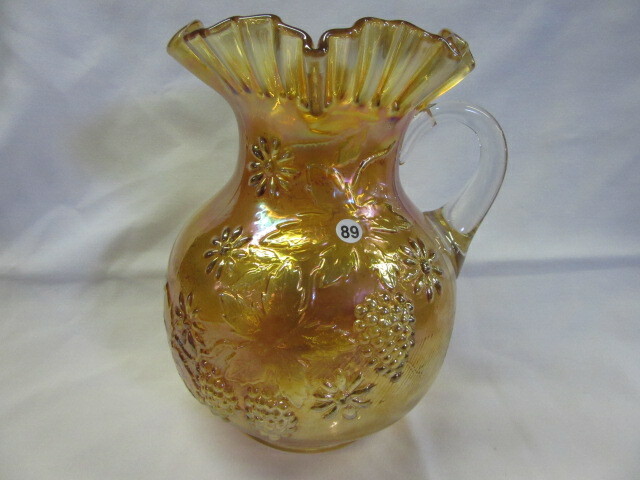 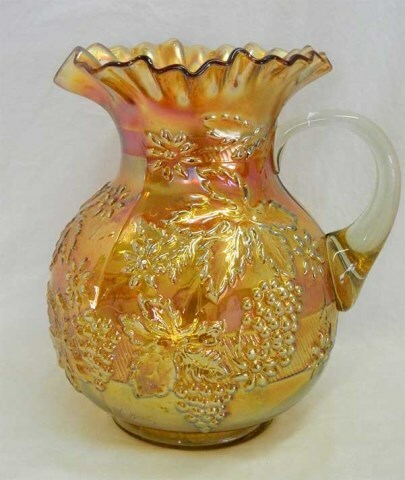 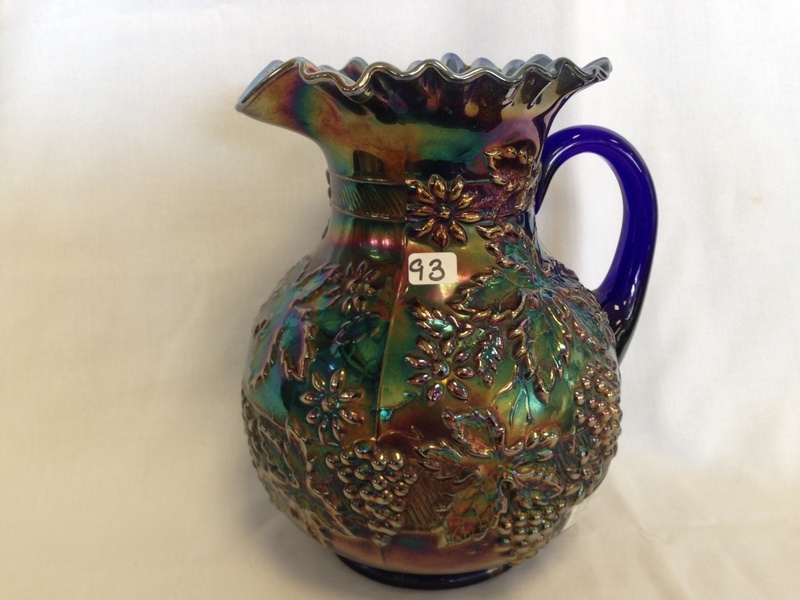 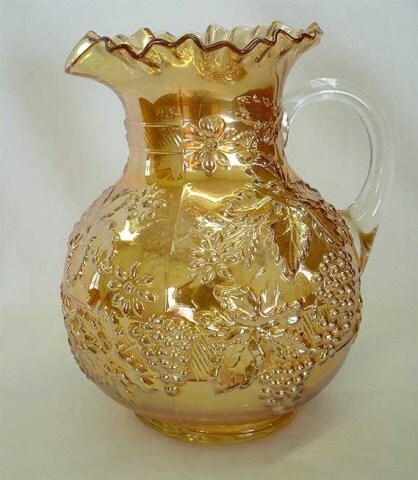 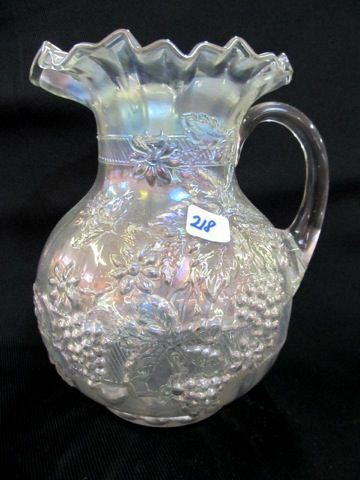 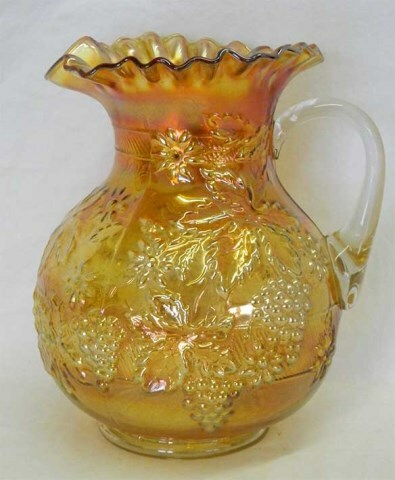 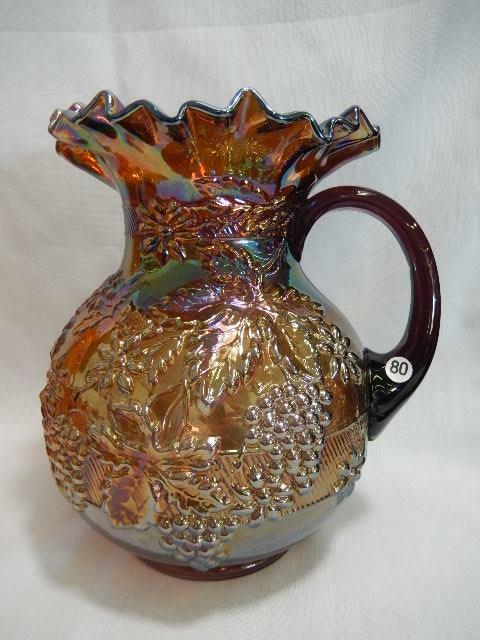 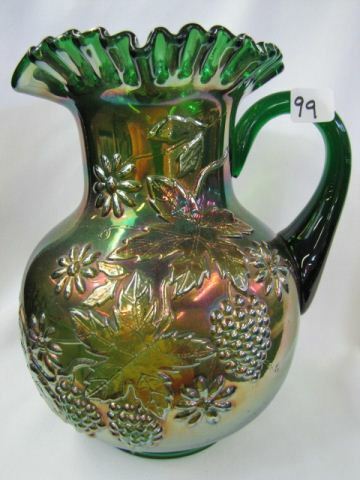 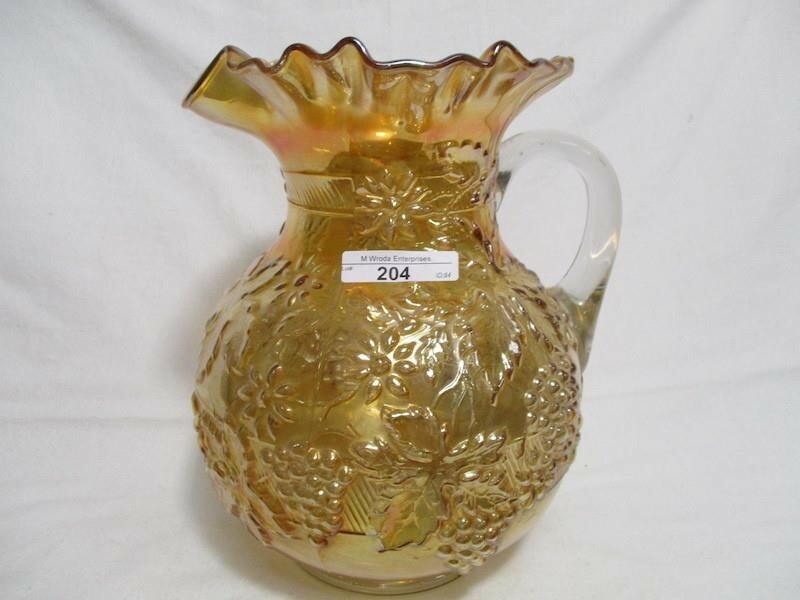 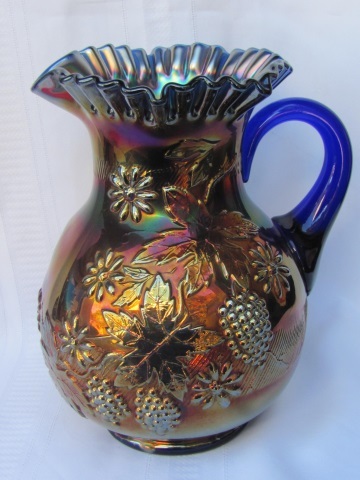 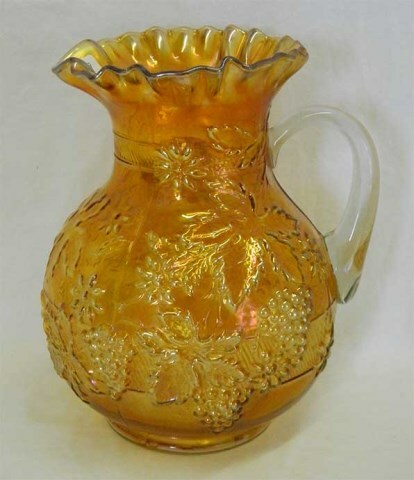 Fenton occasionally made vase whimsies by leaving off the handle of a pitcher and necking it in near the top. 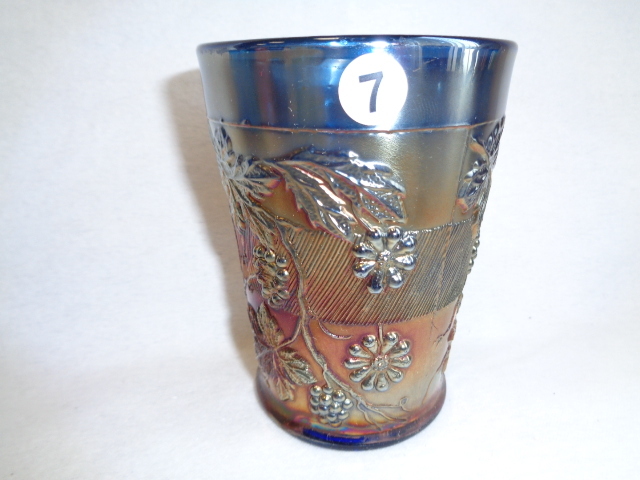 The one on the right is blue.